Scent advertising is being used in creative ways to promote sales and support branding efforts for food, clothing, cars and even nursing homes. Scent advertising is nothing new, as anyone who has had a sneezing attack after opening a fashion magazine can attest. Retail chains have signature scents that permeate the entire store and all their merchandise. Many consumers can identify the store immediately upon smelling their signature scent. Hotels waft subtle scents throughout their establishments to impact the visitor's mood. Food stores entice shoppers with the smell of freshly baked bread, even when there is no bread baking. Dunkin Donuts in Korea has taken scent advertising a step further. Their marketing agency, Cheil Worldwide, created a "coffee atomizer" to be used in conjunction with radio advertising on public busses. Earlier this year they tested it out. Whenever the radio jingle played on a bus, the atomizers released a burst of coffee aroma. Outdoor print advertising was placed at bus stops so it would be seen when people got off the bus. In Korea, consumers did not associate Dunkin Donuts with coffee, so the challenge was to make them want Dunkin Donuts coffee, not just coffee. According to the company it did jut that. Overall, stores saw a 16% increase in sales with a reported 29% increase in coffee sales at stores near bus stops. Using the enticing aroma of coffee is not an entirely new idea. In 2009, gas stations in California, Nevada, Ohio and Florida tested a program where coffee ads played on a screen at the pump while coffee aroma was released into the air. Participating stations reported a 300% increase in coffee sales at the attached stores. When the aroma element was removed while the ads played, coffee sales increased only 75 to 80 percent (www.theatlanticcities.com). The Atlantic Cities also reports that scentvertising is being used in England to promote sales of baked potatoes. 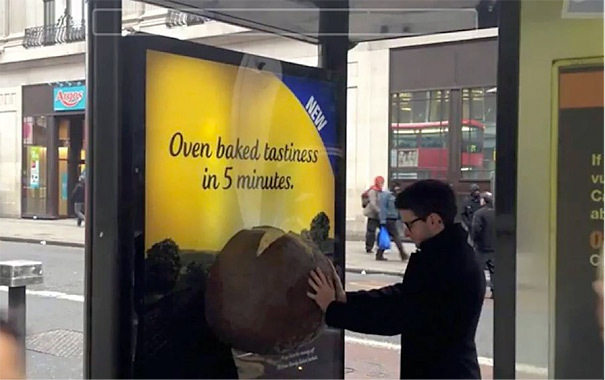 The advertisements appear in bus shelters in London, Manchester, Glasgow and other cities and have a large fiberglass baked potato emerging from the billboard. When the potato is pressed, the a smell reminiscent of oven baked potato is emitted. The results of this recent campaign are not in yet, but the company is hoping for a better response than the one received by the California Milk Processor Board's attempt at subliminal bus stop advertising in 2006. As part of their incredibly popular "Got Milk" campaign, smell strips were included in San Francisco bus shelter ads that wafted the smell of freshly baked cookies. The idea must have seemed harmless to the creators but the residents of San Francisco saw it very differently. Within 36 hours of the ads going up, they all had been removed due to complaints. People objected that the ads were promoting obesity and diabetes, others were fearful that they might cause an allergic reaction, and still others felt the ads were insensitive to homeless people as they might make them feel more hungry. Other businesses are using scent in creative ways with more success than the San Francisco debacle. Disney has been using it for years in their theme parks to both boost food sales and enhance the ride experience. Rolls Royce created a scent that now emits from underneath the seat of new cars which they call "Old Rolls". I am assuming they are referring to the classic car not moldy baked goods. A Seattle bank has its ATMs dispense mint-scented money in hopes of fostering brand loyalty. Nursing homes in England release a scent that they feel creates a sense of nostalgia among their residents. Scent marketing has become so prevalent that it takes a full service creative agency to come up with new and surprising ways to use it. If you'd like help devising ways for scent to be a part of your marketing and branding program, contact us!